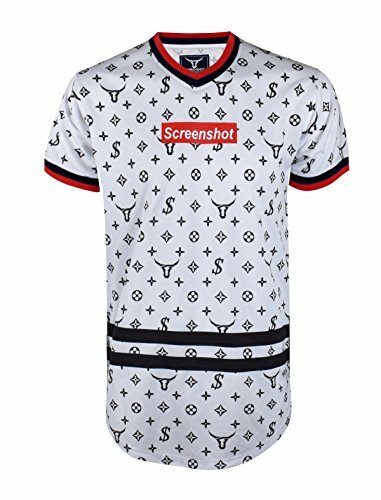 • LATEST FASHION LOGO PATTERN JERSEY TEE: Specially designed for a stand out appearance, SCREENSHOT BRAND Fashion Tees are manufactured using the most advanced printing technology available today. SCREENSHOT BRAND amplifies your street style while promoting a sense of individuality. • STYLISH LONGLINE JERSEY PRINT TEE: Urban inspired T-Shirt instantly takes your style from bland to bold. With several styles and colors to match your closet for a modern and effortless fashion, these tops will feel great, look great, and turn a few heads. SCREENSHOT BRAND is a Streetwear Fashion Company launched exclusively for E-Commerce. Located in the capital of the fashion world, New York City, our inspiration is based on inner city statements, and cultural movements. Even though we are under a constant state of evolution, SCREENSHOT BRAND shares deep values like originality, quality, attention to details, and exclusivity. Our focus is to provide our customers with a great online shopping experience and deliver highest standards of satisfaction.